Brown-Forman is a company that manufactures alcoholic drinks such as Jack Daniel’s whiskey, Finlandia vodka, Southern Comfort whiskey, el Jimador Tequilas, and Korbel wines and champagnes, among many other products. Through these alcohol brands, Brown-Forman literally turns water into gold. With minimal leverage employed, with assets nearly doubling liabilities on the balance sheet, Brown-Forman enjoys incredible margins on its products. Gross margins at nearly 70%. Operating margins at 33%. Net profit margins of 22%. The high margins allow Brown-Forman to boast Return on Assets of 16.5%, Return on Equity of 35%, and Return on Invested Capital of 23%. What makes this even better is that margins have expanded over the past 10 years and so have the profitability ratios. This is a company, like a fine wine, that has been getting better with age. When we take a look at the revenues generated over the past 10 years, we see that it has gone from $2 billion to $3.1 billion today, for a modest annual average growth rate of 4.5%. Net profit has gone up from $320 million to $684 million due to expanding margins, which has allowed net profit to grow at almost double the pace of revenue at nearly 8% on average every year. With total shares outstanding shrinking 10%, from 231 million to 209 million by 2015, earnings per share has been able to grow at an even higher rate than revenue or net profit, growing by almost 9% every year on average from $1.38 to $3.21 per share. The strong economic engine of this business has allowed it to pay out dividends at an ever increasing rate over the past decade: you got to experience dividend growth of 8% year after year over the past 10 years with a payout ratio of around 42% of net profits. While the dividend yield may be relatively low for those who focus on dividends, the cash profit being generated by this firm is incredible. With a smaller starting yield and relatively low payout ratio, you should expect to experience greater dividend growth year after year as opposed to a stock with a high initial yield. However, while the business is as excellent as one I have ever seen, the stock is not quite as attractive at current prices. Right now, based on trailing twelve month earnings, you are paying almost 30 times earnings for a piece of the business. This is a stock that has a normal earnings multiple around 22 based on historic data. While paying almost 30 times earnings for a stock of this quality would probably work out fine over the long, long run, if you are after value, this is a stock you add to your permanent watchlist and wait patiently for the valuation to get to a more reasonable point. 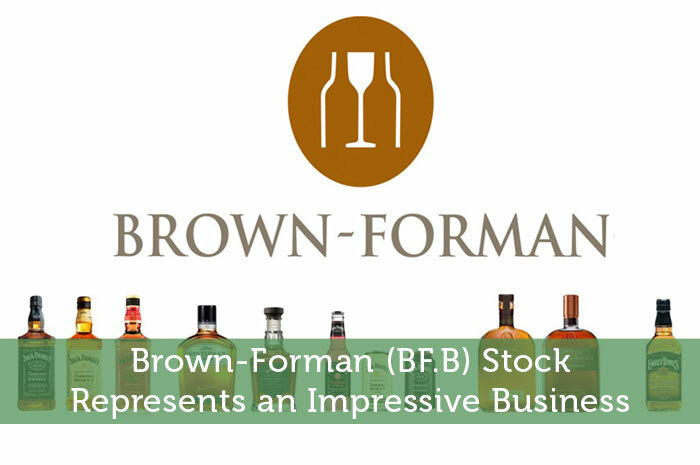 Brown-Forman is the type of business that you add as a permanent, pillar holding in your portfolio. This is something you buy at a great price and leave alone for the rest of your life. The consistency at which it sells its products at a premium is something to behold when looking through its financials. Add it to your watchlist and wait patiently.